The United States has insisted that international participation; specifically foreign judges are needed in a special court that will probe war crimes that is believed to have taken place during the last stage of the war in 2009, which reportedly killed at least 40,000 civilians. 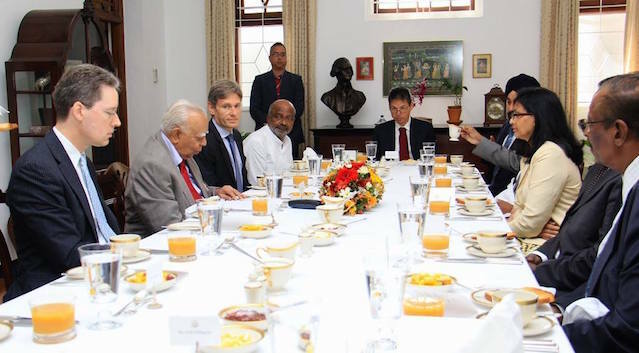 US Assistant Secretary of State for Democracy, Human Rights and Labor, Tom Malinowski has said that international participation in a special court had been emphasized by the international community because of “an erosion in the confidence” in Sri Lanka’s courts over the years. He made this statement while speaking to journalists on Thursday. Malinowski, along with US Secretary of State for South and Central Asian Affairs Nisha Biswal is in Sri Lanka on an official visit. The statement from Malinowski also comes amidst increasing concerns that Sri Lanka will not stick to its pledge to the UN that international participation will be permitted in such a court. Malinowski emphasized that while there were complicated matters in such a process, it was also important that they were done in a manner which will enhance the confidence of the public and all communities. According to him, the UN resolution has respected Sri Lanka’s sovereignty, which was why according to the resolution; the Government of Sri Lanka was allowed to determine the structure and composition of the court. Early this month, going against the undertaking given to the UN, President Maithripala Sirisena declared that until he is the President of Sri Lanka, no foreign judges or courts will be part of any judicial process. “As long as I am the President of this country, I will not allow for any international courts, international judges and international organisations to interfere with the internal affairs of Sri Lanka and the judiciary,” he said. Mr. President; Where Is My Laptop?